What are the Impacts of Online Feedback in Healthcare? Giving honest feedback is never a simple matter, and that is perhaps particularly so in the context of healthcare. When you feel at your most vulnerable, and you know your care – or the care of a loved one – relies on maintaining good relationships with care givers, feedback becomes a complex, conflicted issue. Back in 2005 we set up Care Opinion (then called Patient Opinion) to address this challenge. We started by thinking about the obstacles to online feedback. The first, most obvious, barrier was fear of being labeled “the difficult patient”. The second was cynicism: feeling that, whatever you say, it won’t make any difference. Both these barriers are borne out by research evidence. We wanted feedback about care to be simple, safe and worthwhile. But more than that, we wanted it to feel simple, safe and worthwhile to someone thinking of posting their experience. So from the start, our ethos in building Care Opinion has been that story authors remain anonymous, that interactions are public and transparent as far as possible, that we share each story as widely as we can, and that the story author is kept in the loop. As a small, non-profit organisation, our resources are limited and our progress has been slow but steady. We have listened carefully to feedback ourselves, from patients and healthcare staff alike, about what they wanted from our platform. Now, after 13 years of work and with 100,000 visitors each week, we are heartened that so many of our early intuitions about how online feedback should work, and the benefits it could have, seem to have been right. 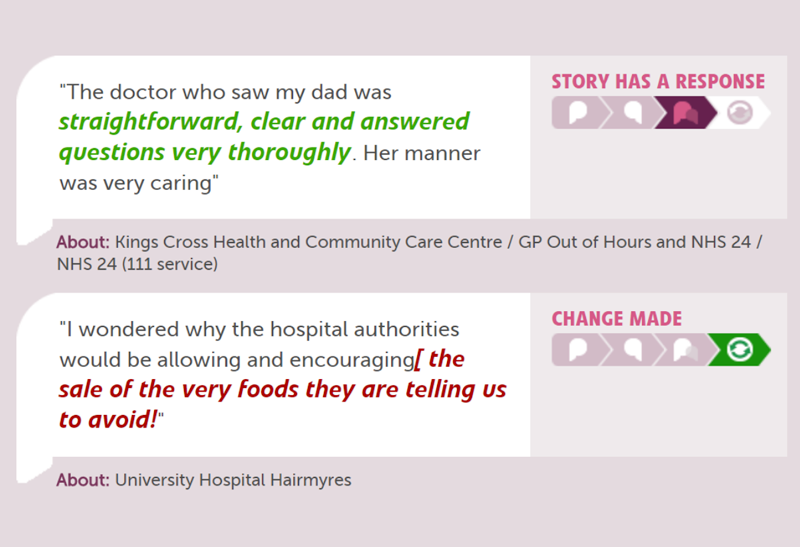 Some of the impacts are obvious through the public interactions you can see on Care Opinion. Healthcare staff respond directly to about three-quarters of the feedback posted, and around 80% of those responses are viewed as helpful by story authors. Sometimes (but not as often as we would like), staff identify how the feedback has led to some change in policy or practice in their service. In the most strongly engaged organisations, there is an emerging sense of a wider cultural impact too: staff describe a morale boost, greater pride in their service, less defensiveness, a stronger focus on improvement. But it isn’t all plain sailing. We still face big challenges in growing our service and our impact – the “dose” of feedback in the UK healthcare system is still far too small. Even now, too few patients are aware of Care Opinion, and too few staff are actively engaging with the stories shared. As we slowly scale up, we must keep costs low, and maintain the quality of our moderation and support systems. Crucially, we need to ensure that we increase positive impacts for patients, staff and the wider healthcare system, while making those impacts ever more visible for everyone. Although we lack resources, we are lucky to have a wide community of support, we remain as determined and as persistent as we were when we started this journey, and we’ll continue to share our learning as we go. Wish us luck! Dr James Munro is chief executive of Care Opinion, the UK’s leading non-profit online feedback service for health and social care. His background is in clinical medicine, public health, and health services research. After 13 years in health service research at the University of Sheffield, James joined Care Opinion (then Patient Opinion) in 2006 to help build the public online feedback platform which now serves the UK, Ireland and Australia. As CEO since 2014, he leads a small team united by a passion for using the extraordinary new possibilities of digital communication to carry the voices of patients and carers into the heart of the health and care system, in ways which make a real difference to services and culture. At Care Opinion (www.careopinion.org.uk), people share their experiences of care – good or bad – and can see whether services are listening, acknowledging, and changing where necessary.